Cloudy with light rain early...then becoming mostly clear overnight. Low 42F. Winds NW at 10 to 20 mph. Chance of rain 70%..
Cloudy with light rain early...then becoming mostly clear overnight. Low 42F. Winds NW at 10 to 20 mph. Chance of rain 70%. 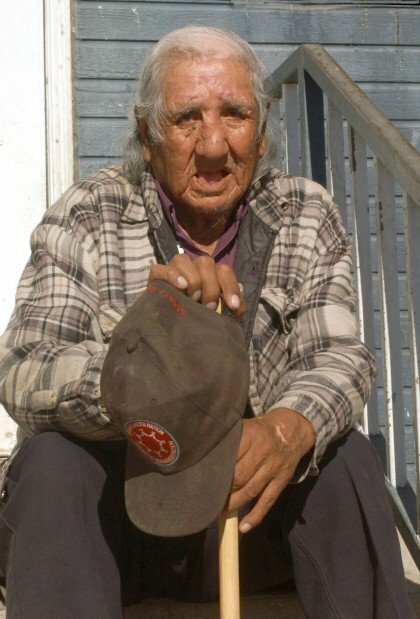 Clarence Wolf Guts sits on the steps of his son's home in the town of Wanblee on the Pine Ridge Indian Reservation in South Dakota in this 2004 Journal file photo. Wolf Guts died Wednesday, June 16, at the age of 86. 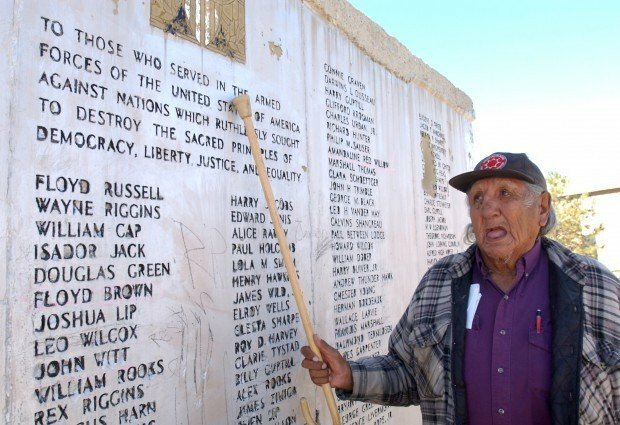 "This is why we fought in the war," says Clarence Wolf Guts as he taps with his cane the inscription on a monument to members of the Oglala Sioux Tribe who fought in World Wars One and Two. Wolf Guts, who is now nearly 80, served in the Pacific in WWII as a Lakota code talker. Wolf Guts was in his late 70s at the time, so his son, Don Doyle, did not make the call, but said the request personified his father's love of country. "He still wanted to help. He was trying to still be patriotic," Doyle said. Wolf Guts, 86, the last surviving Oglala Lakota code talker, died Wednesday afternoon at the South Dakota State Veterans Home in Hot Springs. A Native American code talker from World War II, Wolf Guts helped defeat Axis forces by transmitting strategic military messages in his native language, which the Japanese and Germans couldn't translate. "He's the last surviving code talker from the whole (Lakota) nation. It's going to be a little like the passing of an era," Doyle said. The 450 Navajo code talkers were the most famous group of Native American soldiers to radio messages from the battlefields, but 15 other tribes used their languages to aid the Allied efforts in World War II. Wolf Guts was one of 11 Lakota, Nakota and Dakota Native American code talkers from South Dakota. Wolf Guts, of Wamblee, enlisted in the U.S. Army on June 17, 1942, at age 18. While in basic training, a general asked Wolf Guts if he spoke Sioux. He explained the three dialects to the general and said he spoke Lakota. Wolf Guts helped develop a phonetic alphabet based on Lakota that was later used to develop a Lakota code. He and three other Sioux code talkers joined the Pacific campaign; Wolf Guts' primary job was transmitting coded messages from a general to his chief of staff in the field. Pfc. Wolf Guts was honorably discharged on Jan. 13, 1946, but the horrors of war followed him home and he turned to alcohol to forget, Doyle said. "He tried to keep it all inside," Doyle said. About a decade ago, Wolf Guts started to share his experiences as a code talker with his son and the public. Doyle said his father's deeply religious way of life was also a part of the stories. He always thanked God for bringing him home. With the sharing of his story came recognition of his service and honors, including national acknowledgement through the Code Talkers Recognition Act of 2008 championed by senators Tim Johnson, D-S.D., and John Thune, R-S.D. Both senators honored Wolf Guts efforts and offered their sympathies on Thursday night. "I am deeply saddened to hear about the passing of Clarence Wolf Guts. He and his fellow Code Talkers have had a lasting impact on the course of history and helped lead the Allies to success during World War II. He will be greatly missed, but his contributions to our state and nation will live on," said Johnson. "Clarence Wolf Guts was an American hero; he was courageous and self-sacrificing. I have a great deal of respect for Clarence and for the extraordinary contributions Mr. Wolf Guts made to our country. The efforts of the Lakota Code Talkers saved the lives of many soldiers, and for too long went unrecognized. Kimberley and I wish to express our sympathy to his family during this difficult time," Thune said. Doyle said his father was humbled by the recognition, but was proud of his service during the war. Wolf Guts' desire to help others continued throughout his life well after the war ended. "He considered himself just a man, nobody important. A man that tried to make life better for his family and his people. To me that is his legacy, to be able to help people," Doyle said. "To him, that was being warrior."